Our gift certificate books and Corporate Gift cards are great for business corporate gifts,corporate christmas gifts,incentive gifts,corporate gift certificates,client holiday gifts and company gifts. 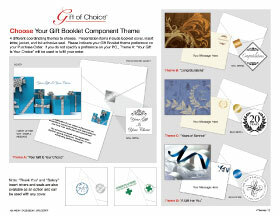 They can be purchased and used as a online gift certificate or a traditional mail in gift certificate. 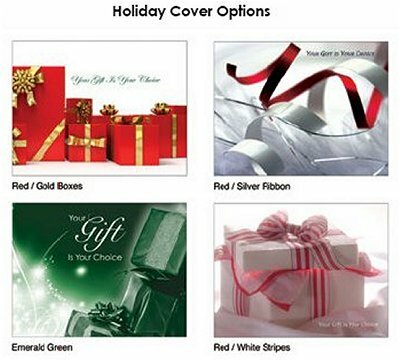 Gift Booklets and Gift Cards are collections of identically priced, brand name merchandise, pictured in full-color selection books and online. Click here to see the 13 collections. Every booklet comes with a redemption card good for one of the many items depicted. 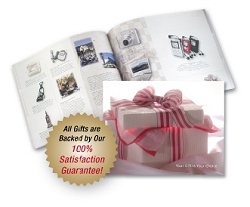 Gift Booklet Presentation Packets will clearly identify you as the giver with an imprinted message, and your recipients will always remember where and how their gift was obtained. Over the years, each time they use the gift selected, a silent thank you is issued. Gift Cards are a contemporary way of communicating a message and giving a gift all on one card. Gift Cards include the choice of a gift, which is redeemed online from the gift value you selected from one of the collections of identically priced, brand name merchandise, pictured online. Click here to see the 13 collections. Whether you provide the art, or we supply it for you, your plastic gift cards are printed in full color on the front, with the website address and redemption number on the back. Card Carriers are also available for a more impressive distribution vehicle. Card Carriers fit into a standard mailing envelope and can be customized to carry a more personalized message from your organization.